Tired of practicing hits and kicks at the air because wood boards are too expensive, time consuming and inconsistent? Neo-Tuesday Inc is pleased to introduce the New line of 'Ultimate' Martial Arts Boards. Do you know what your students are breaking? With the UMAB's colors and strengths you will know what your students are breaking time after time. Each color denotes the different strengths of the boards and/or the different levels of understanding and technique of the individual student. Compared to regular wood boards, the UMAB is sized like and feels like wood, yet offers thousands of consistent breaks. You can make thousands of breaks for about a $0.01 each, instead of the $1.00 or more per break for a wooden board. Using a UMAB can save you thousands of dollars over the cost of breaking wood boards. Since the UMAB breaks consistently, it provides a more accurate gauge of your progress, unlike wood where strength can very as much as 10 times. The UMAB is environmentally friendly because it's made from recyclable nylon. It weighs like wood, but makes far more noise for greater satisfaction. The UMAB is very easy to use. It consists of two separate boards that just snap together. Once in place, the UMAB is ready for action. Edges have been rounded to reduce or eliminate injuries. Rubber padding is available on all seven board strengths to make the boards more comfortable for the holder. Low cost, consistency and range of resistance makes the UMAB ideal for accelerating skills by developing accuracy and confidence. If you're serious about board breaking, you need to know about the UMAB. A new era in the way of martial arts boards has arrived. After five years of searching, we have finally found a Super Tough Nylon that provides a long life and proven consistency. We have performed extensive comparison testing of Pine boards (several strengths) vs. the UMAB and proved our superiority. Wood boards vary as much as 10 times while the UMAB has very consistent performance. See information below for board testing comparisons. To ensure the prescision and quality of each and every UMAB, sophisticated testing was employed during UMAB development. UMAB designed its own specialized testing equipment that measures board strength and breaking consistency. This equipment was also used to demonstrate how inconsistent and unpredictable wood boards can be. The physics are simple. A steel weight is dropped from various heights, in a highly controlled process, on the board being tested, to determine the consistency and durability of wood boards versus the UMAB. The graphs below may be read this way: The left vertical numbers represent the height the weight was dropped from during the testing. The lower horizontal numbers represent the number of times the board was broken for the test. Each graph shows a straight line where the equivalent wood board should break, on average, based upon its size and strength. However, the bold red lines demonstrate the fluctuations of force needed to break wood boards of equal strength as the UMAB over the course of testing. Each graph also identifies a consistent and reliable test line for each UMAB. How does wood compare? The results are below. The three inch wood strip requires weight be dropped on it from heights of one, two, and three feet - giving unreliabe and varied results. In 100 breaks, there are over five different heights that the weight must be dropped from just to break the wood strip. In class, this means each time your students break a three inch wood strip they must use a different amount of force, which could result in injury. The white UMAB board, however, gives a consistent result - the force required to break it does not change through 1000 breaks. The UMAB White Board is perfect for the beginner. Dropping weight on the five inch wood strip from heights of one to six feet gives unreliabe and varied results. The yellow UMAB board, however, gives a consistent result - the force required to break it does not change even after 1000 breaks. The super tough nylon construction is guaranteed to last, and you no longer have to make last-minute trips to the lumber yard to buy boards. Dropping weight on the seven inch wood strip from heights of one to seven feet shows that even a larger strip is not consistent. Each break requires a different amount of force, depending on the strength and grain of the wood. The orange UMAB board, however, gives a consistent result - the force required to break it does not change even after 1000 breaks. The UMAB has weight and flexibility like wood, but is totally reliable and consistent. This helps your students focus on control. Dropping weight on a one inch wood board (nine inches) from heights of one to eight feet gives unreliabe and varied results. The green UMAB board, however, gives a consistent result - once the board is broken, the breaks are very consistent. 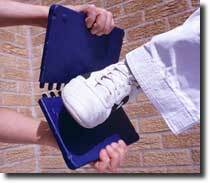 Your students will be assured that every time they break a board they can use the same amount of force. Plus, there are no sharp edges or splinters to worry about. Dropping weight on the 1 x 1/4", 1 x 3/4" and 2 x 1/4" wood boards from heights of one to eight feet gives unreliabe and varied results. The blue, brown, and black UMAB boards, however, give consistent results - the force required to break them does not change even after 1000 breaks. All UMAB Boards are stackable for power breaking and are available with padding on the back side for the comfort of the individual holding the board.